Tired of having no place to hang your jackets, throw your keys, or stow your bags? It's a universal problem, even worse if you live in a vintage Portland home with little to no closet space. The Odette Coat Rack/Wall Organizer is a clever solution to help you calm the chaos of everyday comings and goings. 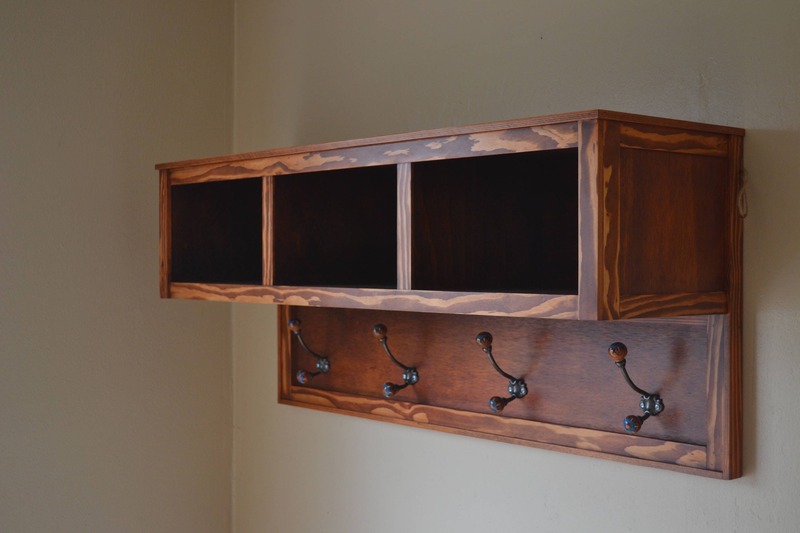 Separate cubbies and coat hooks help you take control when you walk out the door! The Odette can be customized in your choice of finish. Pictured in Minwax Wood Finishes Gunstock. Hooks are another personally customizable option as well, available from a wide variety of local and online retailers. Please contact us for customization options. Approximately 42 inches wide, 18 inches high, and 12 inches deep.